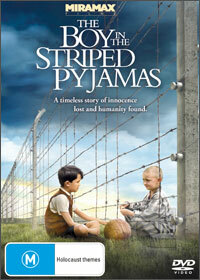 Based on the best-selling novel by John Boyne, The Boy in Striped Pyjamas, the novel actually targeted a younger audience unlike the Miramax interpretation which is directed by Mark Herman. The movie also ignited some controversy regarding the "facts" about the story and of course the English accents of the "Germans" in the film. Pushing this aside, The Boy in Striped Pyjamas is an interesting take on one of the world's most horrendous moments of history, World War II and the use of concentration camps by the Germans. The story of this is seen through the eyes of Bruno (Asa Butterfield), an 8-year old boy who tries to interpret the atrocities of the time in his own eyes. Bruno's life was perfect, until his father (David Thewlis), a commandant in the German Military is called to run a concentration camp away from the German public. Unfortunately for Bruno, he has left his friends behind in the city and as he is stuck in a relatively isolated house in the countryside. He decides to explore, much to the angst of this mother (Vera Farmiga). Through the window of his room, Bruno sees what he believes to be a farm that is in actual fact a concentration camp where he meets Shmuel (Jack Scanlon), an 8-year old boy also incarcerated by the Germans where the two form a strong friendship with a fence between them. With the backdrop of war around Bruno, the director gives us a meaningful insight into those around our star such as his two loving parents who are conflicted by the views of the Jewish people and his sister Gretal (Amber Beattie) who is embracing the propaganda by their tutor. Bruno questions why the German people have labelled the Jews as "evil", especially when he meets Pavel (David Hayman), another Jew who has been ordered to assist the family with menial tasks but seems quite harmless and "nice". When Bruno sees a German officer chastise this man, including his friend Shmuel, he questions the edicts of his father that eventually leads to the powerful conclusion. Although The Boy in Striped Pyjamas was a passionate and powerful drama, there was this deadly foreboding experience just simmering throughout the movie as the viewer was expecting something horrendous to happen that nevertheless does not impact on the shocking ending. With some wonderful cinematography, the video and audio quality is quite subdued and suits the atmosphere of this movie. There are some additional special features on the disc that go beyond the movie, including some interesting deleted scenes. In conclusion, The Boy in Striped Pyjamas is a powerful movie that at times feels quite calculating in taking the viewer on this emotional journey through the eyes of an 8-year old boy.